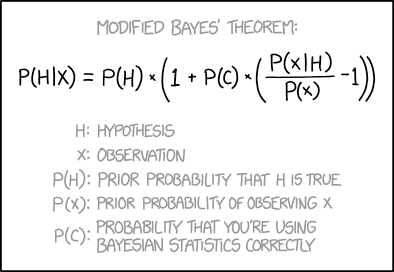 Title text: Don't forget to add another term for "probability that the Modified Bayes' Theorem is correct." Amazed that a thread still wasn't up this late in the day. To further complicated things, that "x" between P(C) and the smaller parenthetical is actually the variable x, rather than a multiplication sign. Justin Lardinois wrote: Amazed that a thread still wasn't up this late in the day. It's vanishingly rare for threads to go up before the comic does. The later the comic goes up, the later the comic thread does. As for the comic itself: if P(C)=1 (and the small 'x' is multiplication) then it reduces to the unmodified Bayes Theorem, as it should. Similarly, if P(C)=0, then it collapses to P(H), the prior, which also seems reasonable. But I'm not sure that a linear cross-fade between them is appropriate. Is this one a math joke? I never get the math jokes. WriteBrainedJR wrote: Is this one a math joke? Yes. The joke is that people misuse Bayesian statistics (which is currently applied in cognitive science, cosmology, social policy, and who knows where else) to draw questionable conclusions from inadequate evidence and that their work should therefore have a correction factor applied to it. Factors would presumably involve one's statistical training, the quality of the data, and how far into the unknown the probability being tested extends (conclusion within a proven model and a testable field much better than testing of a new model for something we have no firm clue about). The thing can't be right because the P(C) ought to be applied only the first time. It's not independent from iteration to iteration. The metastatistic can't be buried in the statistic. rhhardin wrote: The thing can't be right because the P(C) ought to be applied only the first time. It's not independent from iteration to iteration. The metastatistic can't be buried in the statistic. What? You're saying we can't learn from our mistakes? I couldn't decide how plausible it was by just eyeballing it, so decided to run some numbers to check it out. Let's say that X1 has a 50% prior probability of being true, X2 (which is independent of X1) also has a 50% prior probability of being true, H has a 25% prior probability of being true, I believe that H is true if and only if X1 and X2 are both true, and the chance 1-C that I'm wrong and H is independent of X1 and X2 is also 50%. Suppose I observe X1 and X2; at that point, the probability of H|C is 100% and the probability of H|~C is still 25%, so my overall probability should be 62.5%. Let's see if the theorem gives us that result. First, suppose I make both observations simultaneously. According to the theorem, P(H|X1&X2) = P(H)*(1+P(C)*(P(X1&X2|H)/P(X1&X2)-1)) = 0.25*(1+0.5*(1/0.25-1)) = 0.625. So far, so good. Now suppose I make the observations one at a time. First, P(H|X1) = P(H)*(1+P(C)*(P(X1|H)/P(X1)-1)) = 0.25*(1+0.5*(1/0.5-1)) = 0.375. Then, P(H|X2) = P(H)*(1+P(C)*(P(X2|H)/P(X2)-1)) = 0.375*(1+0.5*(1/0.5-1)) = 0.5625. Oops! Apparently the chance that I'm wrong needs to be included in all the conditional probabilities, not just stuck in there as a fudge factor. Too bad. It occurs to me that one way to use Bayesian stats incorrectly is to set P(C) = 42 . You'll get some spectacular results. Near-infinite improbability or something. I want to know what the normal expected value of P(C) is. 0.5? 0.75? 0.1? ThirdParty wrote: Now suppose I make the observations one at a time. First, P(H|X1) = P(H)*(1+P(C)*(P(X1|H)/P(X1)-1)) = 0.25*(1+0.5*(1/0.5-1)) = 0.375. Then, P(H|X2) = P(H)*(1+P(C)*(P(X2|H)/P(X2)-1)) = 0.375*(1+0.5*(1/0.5-1)) = 0.5625. Oops! But is it unreasonable that it would be lower? By running separate observations and calculations, you just added an extra opportunity to mess up the statistics. cellocgw wrote: It occurs to me that one way to use Bayesian stats incorrectly is to set P(C) = 42 . You'll get some spectacular results. Near-infinite improbability or something. This reminds me of something that bothered me when I first read The Hitchhiker's Guide to the Galaxy but I wasn't able to express. Adams's conceit relies on there being a bijection between ℝ (or [0,1], which amounts to the same thing) and the set of all possible events. The corresponding real number can be dialled into the finite improbability drive and the event with that probability is generated. It's intuitively obvious (and therefore almost certainly incorrect!) that the set of possible events has a larger cardinality than the reals*. Even if that weren't/isn't the case, there would be significant practical problems. The probability would need to be entered to infinite precision. An inaccuracy in the googolth decimal place would result in a completely different event unfolding! * Proof by counterexample: suppose that the desired event is "two leprechauns, of heights h1 and h2 respectively, walk into the room". Oh, damn, |ℝ2|=|ℝ|. Ignore that. EDIT: Corrected spelling of "spelling" in my correction of the spelling of "googolth"
Last edited by orthogon on Wed Oct 17, 2018 9:40 am UTC, edited 1 time in total. orthogon wrote: It's intuitively obvious (and therefore almost certainly incorrect!) that the set of possible events has a larger cardinality than the reals*. In a finite universe, with finite total energy, and finite granularity, the total number of ways of distributing that energy in the form of a finite number of types of particle is also finite. Mind-bogglingly large, but still smaller than even the cardinality of the integers, let alone the reals. The point about the required precision still stands, and the idea that hitting a precise improbability factor will cause the corresponding event to happen with absolute certainty is problematic, to put it mildly. For example, what happens if two different people both correctly calculate the precise improbability of them winning the lottery, and pick different numbers? Or there's the question of which factors to consider - when we calculate probabilities, we're not calculating for a specific event; we're calculating for an entire class of events that share certain common features - when you toss a fair coin, there's a 50% chance of it coming down heads, but does it bounce? how long does it take to settle? precisely where does it land? which direction is the head looking when it settles? We can ignore those irrelevant details, but how does the improbability device know to include all, and only, those cases where the coin lands heads rather than a mix of cases where the coin lands heads, and cases where the coin lands tails? From the description of the drive's operation in the book, it's quite possible that the drive iterates down to the exact probability it needs. with some fairly catastrophic environmental side effects. Except that if you happen into the one where all the energy is concentrated into a single point, you get a new big bang, and a different finite universe to distribute it over. Repeat infinitely, and you do have an infinite array of possible distributions. Well, at the risk of being Mr.PedanticBuzzkill, yes you could repeat the BigBang an infinite number of times, but so long as the total amount of energy (and the quantum granularity) are finite, you can't get infinite distributions. You'll just end up repeating some patterns every now and then, sort of like Powerball repeats the winning number set nowand then. It's the ShakespeareMonkeyTypewriter problem in a different guise. cellocgw wrote: It's the ShakespeareMonkeyTypewriter problem in a different guise. Hey! That's my randomly created password! I ran the modified theorem past Dr. Mary Kuhner whom I used to work for at UW Genome Sciences. Her reply suggests Randall might be onto something. That assumes that quantum granularity is consistent, which is an unsafe assumption. It also assumes that the total energy in the universe is related to some external ground state, rather than an arbitrary internal ground state, also not a safe assumption. So long as they're subject to a finite, constant bound, it doesn't matter how variable they are within those finite limits. I put up the thread at noon Pacific time; I'm pretty sure Randall had already had the comic up for quite a while at that point. I can't remember the exact situation this long after the event, but it's sufficiently common to no longer be notable for the comic not to be up at 10am Pacific (6pm here in the UK), so it's plausible that I knew that the comic had not yet been posted less than an hour before you posted the thread, depending when I last checked. I want to say I checked 10-15 minutes before you posted the thread, but, like I say, I can't remember with confidence. It's possible that (with suitable adjustments for time-zones in use by each party) checking when the expkainxkcd wiki entry gets autopopulated by the relevant editing-bot could give you a "no later than" timestamp for when any given comic appears (maybe "and no earlier than 15 minutes before that", or whatever the checking frequency is, unless the script-running service had to be prodded back into action for some technical reason). I know I've seen (or created¹?) a new forum thread before the wiki acknowledged the necessity, when I've been there with opportunity and willingness to compare both. But that could have been not a matter of the Golden (quarter?) Hour. No, I do not camp on sites, just hitting reset every few seconds. It may just sometimes seem like it. ¹ At one point, if I was thread-starter I used to copy title-text from the wiki page, to avoid typing the otherwise uncopypastable text in the hold-tap pop-over. That stopped when I realised I could copypasta from the "view-source:(url)" page, then demunge any HTML unsafe characters according to what I knew they must be. But I'm sure that at least once I found no explainxkcd copy available to save my painstaking manual eyes-to-fingers transfer.